Peach Crumb Slab Pie is made with fresh, ripe peaches tossed with cinnamon, brown sugar, allspice and a pinch of cayenne. The pie is adorned with a buttery, sweet crumb topping. It is made in a jelly roll pan with a pre-made pie crust for ease. It's delicious served with some vanilla ice cream. 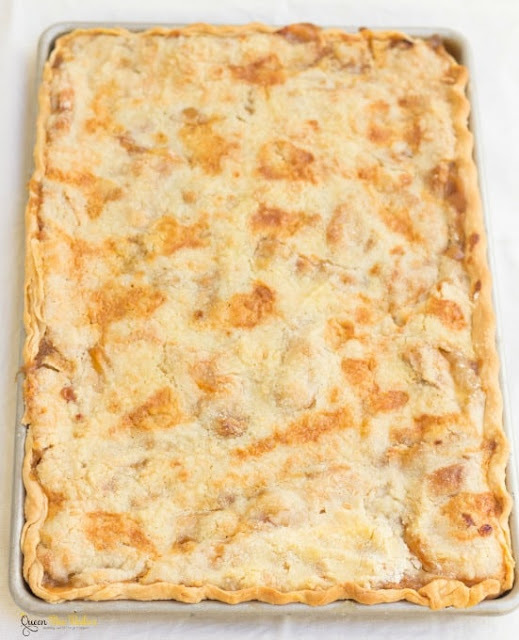 14.1 ounces Refrigerated pie crust If using homemade crust, make enough for a double crust. 4 lbs fresh, ripe peaches You can use frozen instead. Following the instructions on the box, remove the pie crusts from the refrigerator to soften. Unroll both crusts and place one on top of the other on a floured surface to roll. Using a rolling pin, roll out crust to a 12-inch x 17-inch rectangle. Once your pie crust is rolled out, turn it out into the ungreased jelly roll pan. Spread the dough into the pan evenly. You can crimp the edges of your crust or use a fork to press a design into the dough. Set aside. In a medium bowl, blend together, flour, brown sugar, cinnamon, allspice, cayenne and salt. Set aside. Peel your peaches and cut them up into thin slices. Blanching the peaches makes them easier to peel. To blanch, first score the bottom of each peach with a knife. Drop the peaches into boiling water for 40 seconds. Remove the peaches with a slotted spoon and cool them in an ice water bath for 1 minute. Dry off the peaches and peel. Cut peaches into thin slices. Put sliced peaches into a large bowl and toss with lemon juice. Pour the filling mixture into the bowl. Stir peaches with filling mixture until combined. Pour peaches into pie crust and spread evenly. In a medium bowl, combine flour and sugar for the topping. Using a pastry blender or fork, cut cold butter into the flour mixture until crumbly. Spread crumb evenly over pie. Cut up 1/4 cup butter (1/2 stick) into cubes and dot onto the top of the pie. Bake pie in 375-degree oven for 50-60 minutes until golden brown and bubbly. If the crust starts to brown too much, you can cover those areas with some folded aluminum foil. Remove pie from oven and cool on a wire rack until just warm or room temperature. Serve with vanilla ice cream. Pie should be stored covered in the refrigerator for up to 5 days or frozen for up to 3 months. Calorie content is based off of once slice of pie. 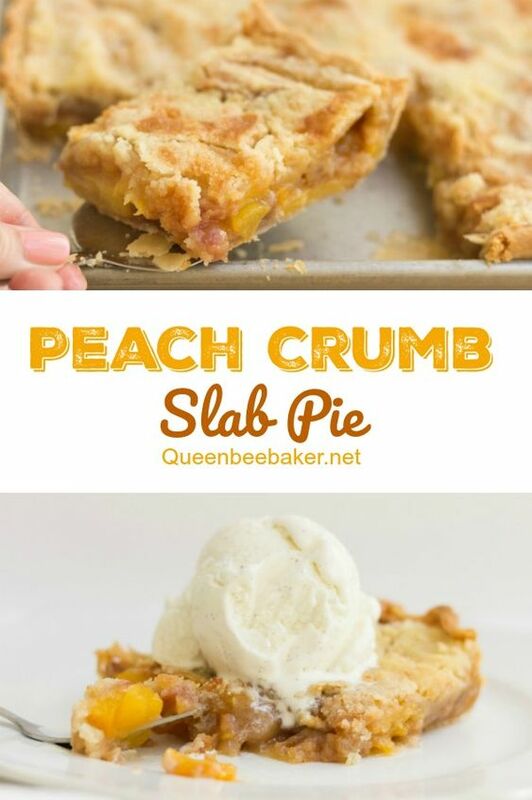 0 Response to "PEACH CRUMB SLAB PIE"